I truly can’t believe it’s already time for another year-end recap. I feel like I just wrote the Bye, 2016 post and here we are at the end of 2017 already. The 2015 recap was on the eve of the release of “Rocket Science” and also mentioned the film “Traces” that was supposed to come out in 2016. Whatever happened to that movie anyway? C’mon producers, finish it up already. Concerts: RS had a busy year in 2017, which isn’t unusual. RS fans were treated to nearly 100 concerts, which included full-band shows, Stripped Down solo acoustic shows, acoustic shows with Richard Marx and concerts in Europe with a symphony orchestra (The Rock Meets Classic tour). Unfortunately, he also had to cancel a few shows due to illness and surgery, although he still performed several shows while ill and with cracked ribs, a torn tendon and a twisted ankle. Guest-starring roles: On the acting side, he freaked out his fans a bit with his portrayal of Lucifer in “Supernatural” and as a horrific pastor in “American Horror Story”: Cult.” In a recent article, RS mentioned that he would like to find a TV series to work on and I really hope that when he finds the right role, it won’t be another one of those creepy characters that he appears to be so fond of portraying. 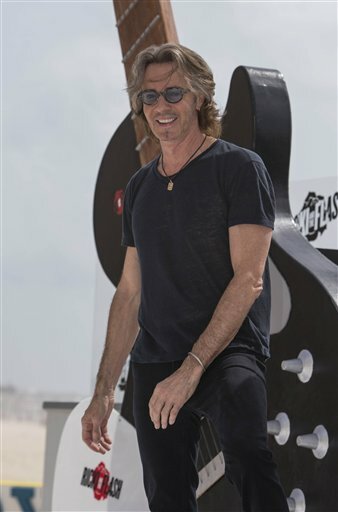 Fans were busy, too: Besides travelling around the country to attend RS concerts (and fortunately sharing many photos and videos on social media), RS fans were busy in other ways, too, with putting together a Rick Springfield live-stream radio station featuring five decades of his music, organizing Get Rick Fit fitness challenges and raising more than $17,000 for Linda Blair’s Worldheart Foundation through the fan-led Rick Springfield 68th birthday campaign, which was in memory of his mom, who died on Dec. 21, 2016. For me personally, it’s been a quiet RS year, as there were no encounters or concerts to speak of, just a lot of listening, watching and writing (about 75 blog posts). As for this blog, there were 8,894 views by 5,315 visitors in 2017 and I really appreciate everyone who has read and shared the blog (and I’m glad to know I’m not alone in my RS crush). As of Dec. 31, 2017, the blog has had 26,313 views by 14,903 visitors since its inception in August 2014 and this is the 314th post. What’s next for 2018? Besides the release of “The Snake King” in January and some upcoming concert dates, which include a launch party in Los Angeles for “The Snake King,” an acoustic set at The Grammy Museum, which was sold out to members before going on sale to the public, and shows with the Oregon and Nashville symphonies, who knows? Maybe “Traces” will be released. Maybe there will be a prequel or sequel to “Magnificent Vibration” or a follow-up to “Late Late at Night.” I guess we will find out over the next 12 months!